Hopelessly Devoted Bibliophile: An Interview with authors Margaret Weis and Tracy Hickman, plus a giveaway! An Interview with authors Margaret Weis and Tracy Hickman, plus a giveaway! A little background for this post, because my fangirl tendencies demand I tell you why I love these books. First off, Fantasy is/has been/will always be my favorite of all genres. I adore getting swept away in a good story. That being said, my the first books I fell in love with when I discovered this genre were the Dragonlance series books. Fantasy fans will know what I'm talking about. They were epic, and plentiful. 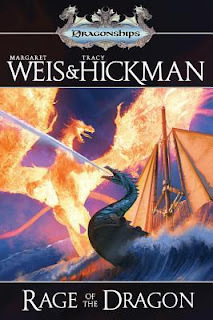 Margaret Weis and Tracy Hickman always stood out as authors in that series. Every book that they penned together was fabulous! I was smitten. So imagine how I felt when I was approached to not only read their newest book, but host an interview with them as well! I nearly fainted. I digress. Here's the book to speak for itself. If you enjoy Fantasy you must start this series, but I'll stop babbling and let these two amazing authors take it away. Make sure you read to the bottom. There's a giveaway waiting for you there! 1) If you could transport yourself to any fictional land, where would you want to visit? (TH) Most fictional lands are pretty frightful ... places where dragons rage or terrible epic battles are taking place. Not the best of places to spend one’s leisure time! If there is one place I would like to visit, it would be a little village called ‘Eventide’ in our fantasy world of ‘Dragon’s Bard.’ We specifically wrote that as the kind of place one would like to visit with people you would like to meet. (MW) The world of Aeronne, which features in my new series, Dragon Brigade, I'm doing for Tor along with co-author Robert Krammes. This is a world of floating continents, magic in the very air you breathe, wyvern-drawn carriages, soldiers on dragon-back, saints, demons flying on giant bats, castles drifting in the clouds. 2) Do you have a favorite character, from your fantasy worlds or elsewhere? (TH) I have many favorite characters characters but each of them for different reasons. One of the spookiest, for example, is Miss Havisham from Charles Dicken’s ‘Great Expectations.’ I very much enjoyed writing Harley Quinn for my ‘Wayne of Gotham’ Batman novel. My favorite character, I believe, is also from ‘Eventide’ –Beulandrius Dudgeon, the blacksmith dwarf who secretly wants to dance. (MW) Oh, so many! Lady Maigrey from Star of the Guardians, Raistlin and Tasselhoff from Dragonlance, Skylan from the Dragonships series, Father Jacob Northrop from the Dragon Brigade. (TH) My favorite part about being an author is sharing the creation of story with readers. Writers may create the script but it is the reader who actually provides the performance. I love being part of that creative experience for every reader. 4) Who or what provides your inspiration? (TH) I get my inspiration from many sources. I love to read and I love to go to movies. I also love life and the experience that it brings, both good and bad. I also find much inspiration from my faith. A huge thank you to Tor, Margaret Weis and Tracy Hickman for providing this interview! I can't say enough how wonderful it was to get to know more about two of my favorite authors. Now, it's time for a giveaway! Up for grabs are 3, yes three, copies of Rage of the Dragon. The publisher has been extremely generous, and I'm pleased that I can offer so many of you the opportunity to read this book! To enter, fill out the Rafflecopter form below. You must have a mailing address in the U.S. or Canada to enter! A winner will be chosen on May 30, 2012. Good luck!